It's your friendly neighborhood Spider-Man and he's ready to make your child's birthday party great. Peter Parker may be a timid person, but he's a force to be reckoned with as Spider-Man. Even the web slinger himself would love these party favors and party supplies. Spider-Man has been a mentor and inspiration of children for decades, so it makes the perfect theme for your child's birthday party. 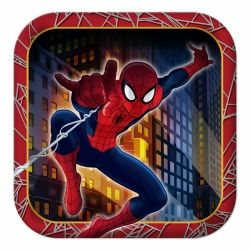 Spiderman Hero Dream Party Lunch Napkins 16ct.